By now, I trust, you’ve meandered through our website and seen the design element of our baking passion. You’ll have also seen that my own baking, is somewhat lacking. It’s fine – don’t worry about offending me, I understand my limitations. And that’s why I’m always on the lookout for exciting cookie and biscuit designers. In my travels across the web, I’ve seen some beautifully iced biscuits of every shape you can imagine and thought, ‘now that’s something worth sharing’. Et voila a blog is born…. Or baked even. Don’t worry – I’ll stop there! We begin our iced biscuit journey! 1. I’ll start with Juliet Stallwood Cakes and Biscuits. A few of the designers I’m highlighting in this post also do cakes. Not a problem – the more baked goods the better I say. Juliet runs her business from the Dorset village of Semley. She started at the kitchen table but has now progressed to a big barn. 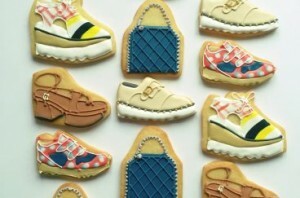 She’s had her biccies delivered to the likes of Stella McCartney, Selfridges and John Lewis, alongside her work with large brands – Coca Cola and Virgin Media to mention a couple. 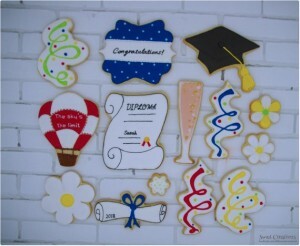 My favourite is the simple but impressive blackboard cookie. 2. A similar story awaits us with Honeywell Bakes, where Rebecca and her sister Rosie set up the business in 2013. Rebecca’s, ‘beautiful design led biscuits’ are an instant Instagram post. What I like most about Honeywell Bakes, is Rebecca’s enthusiasm for sharing her love of baking. As in in this video showing you how to create Unicorn Head Biscuits. How amazing is that? 3. The special element of our next designer, Little bee bakery is the power of natural ingredients. Driven by the desire to create biscuits that contained no additives or preservatives for her son, Melissa created Little Bee Bakery. And, judging from her reviews on Facebook, her vegan cakes are an absolute hit. 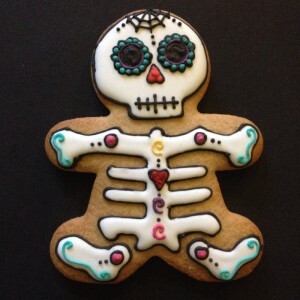 Alongside the impossibly cute, Day of the Dead, Gingerbread man. 4. 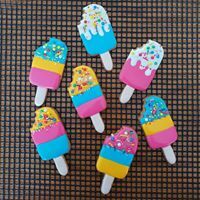 Whilst mooching around on Facebook with our own page, I found Biscuits and Icing, based in Chelmsford Essex, Charlotte has set up a fantastic page, showcasing her designs. So if you’re in the Chelmsford area, she is worth tracking down. 5. I’ll be honest the next designer grabbed me because of the name of her company The Kitsch Hen – which I found via a Pinterest pin. The wonders of the web eh? But I digress, Caroline’s biscuits are not only iced, but contain a quotation. We’ve all trawled Instagram for motivational quotes. Well, Caroline has taken that a step further, incorporating them into a thing of love, a biscuit. 6. Whilst we have our own shop on Etsy we do find it a bit distracting. That’s how we came across the Sweet Creations 21 Etsy shop. They also have a website. Again, like Rebecca from Honeywell Bakes, Kwang shares her extensive knowledge, showing you how to decorate biscuits at home. I like that it’s not a given that you will buy, and sharing knowledge, so you can create your own moments of bliss! 7. 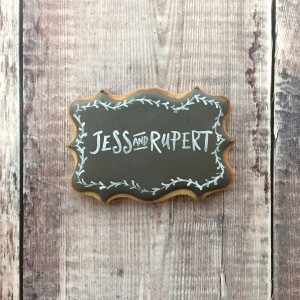 Marie’s Bakehouse – Marie bakes and produces her cookies, cakes and cake toppers from her kitchen table, and posts them out directly to you. I like Marie’s quirky sense of humour, yes the other designers I’ve shown you are fun too, but Marie made me chuckle!! 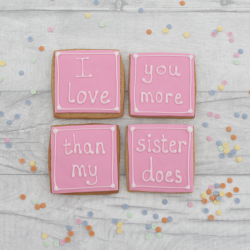 I loved the Mothering Sunday biscuits ‘I Love You More than My Sister Does’. So apt in my own life!! I found Marie on Yumbles.com, a new site to me. I won’t be making that mistake again. You can buy and eat all manner of yumminess from this website. The collection ranges from Marie’s baked goods to vegan cakes to Isle of Wight Biltong? 8. The final designer I want to share with you, may be the best known. 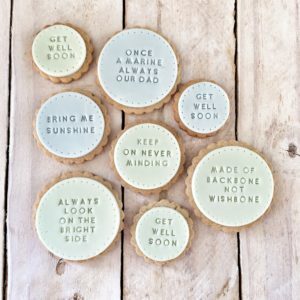 The Cookie Collaboration is a family run business in Lancashire. 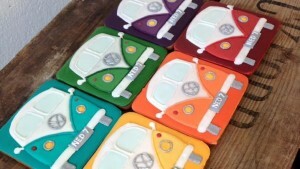 It sends cookies worldwide, and has recently featured in Brides Magazine. 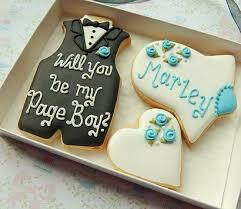 A growing trend amongst brides is to ask their prospective page boys and bridesmaids, with a gift. Amanda from The Cookie Collaboration, offers cookies as a way of doing just that. So there we have it, eight of the best iced biscuit designers in the UK – in my humble opinion. Whether you’re looking for a personalised, edible gift of love, or some inspiration for your own baking, these designers will inspire. If you do fancy baking and icing biscuits yourself, here’s a great video on flood icing (a skill I’m yet to acquire), and of course there’s our cookie cutters (plug, plug!). And I reckon, in truth, I only wrote this blog to show you great pictures of biscuits. Crumbs!